Infinity Ward's "Call of Duty: Modern Warfare 3" increased the excitement of the popular first-person shooter franchise. Released in 2011, gamers still fire it up for its outstanding competitive play. Jeep's Wrangler Call of Duty MW3 Edition, like fans of the game, came to play. Based on the uncommonly tough Rubicon, the edition featured a sharp power-dome hood, a super-strong winch-ready bumper, 32-inch mud-ready tires, Mopar rock rails and lamp guards and a stunning logo. That logo was featured proudly on the spare tire cover, and Just for Jeeps offers the exact same cover for your Wrangler or Liberty. Made from black soft-top material, the MW3 cover will leave your spare feeling bulletproof against the elements. It's crafted by OEM Mopar, the same company that assembled the other parts of this special edition. At Just for Jeeps, we work directly with Mopar to offer you the same showroom accessories without a dealer's markup. 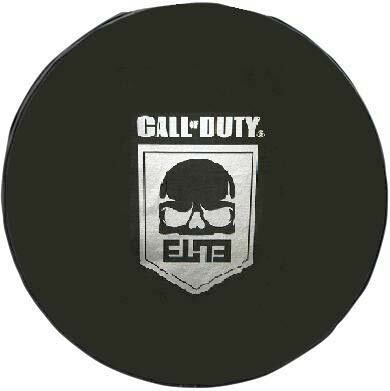 The MW3 Elite spare tire cover is a real-life prestige emblem you'll be proud to display. Take the thrill of the game on the road - or off-road. Arrived on time, the price was great and the customer service rep I spoke with made the transaction super easy.